We’ve been hearing from our customers for a while about the difficulties that come with setting up and transporting VR workstations. We also had a problem ourselves – we have anawesome new virtual reality meeting and collaboration platform called Vizible, but not everyone we want to meet in VR has a system that we think does justice to the experience. We needed a system that was strong enough to ship to our clients and provided top-of-the line immersion, but was easy enough to use that a person new to VR could set it up easily. At WorldViz, we have more than 15 years of experience designing VR hardware and software solutions, and a few months ago we put our heads together to see how we could address this problem.We came up with the WorldViz VizBox, a first-of-its-kind, patented, portable VR system for professionals. The VizBox delivers fully immersive 6DOF virtual reality content and is designed to be self-contained with minimal set-up. Housed completely inside a sturdy Pelican case, it’s robust enough for safe shipping and travel. We’ve been putting VizBoxes to the test ourselves by shipping them to customers and taking them to trade shows around the country, and they’ve proven to be resilient and powerful. People that stopped by our booth were surprised by the elegance and simplicity of the solution – they wanted one! This further motivated us to refine the product and bring it to market. We’re incredibly proud of the finished VizBox product. Powerful Performance: We demand the highest quality VR experience for our customers, and ourselves. The Vizbox delivers a top of the line, PC-based, fully immersive solution, based on workstation architecture with high end Nvidia graphic cards. 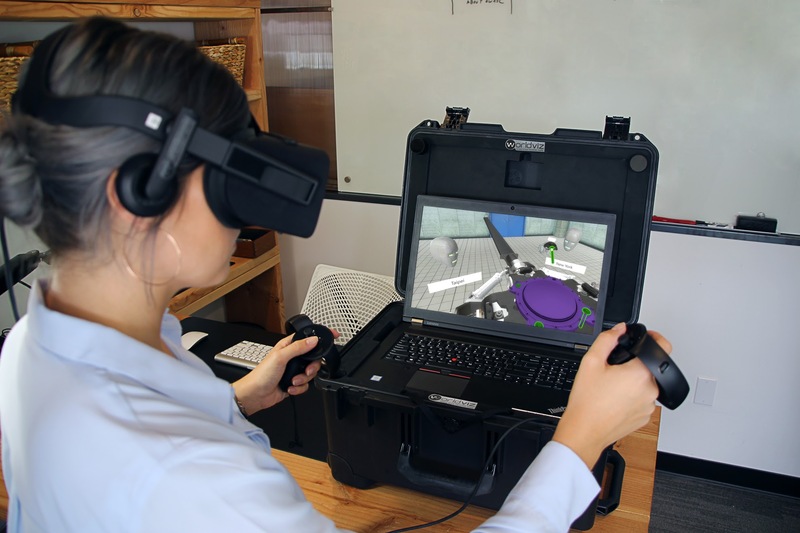 Completely Self-Contained: With the VizBox, everything you need to experience professional quality VR content is right in the box, including an enterprise class VR-ready laptop, all connecting cables, and an Oculus Rift HMD with touch controllers. 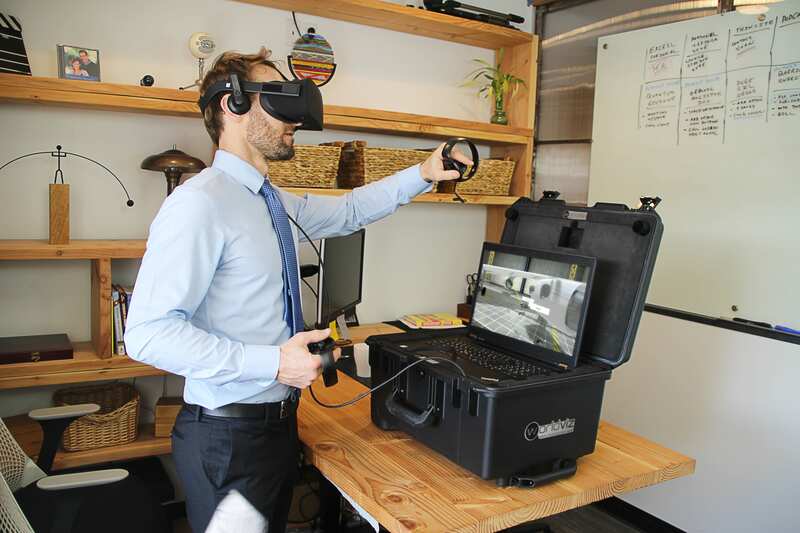 Ease of Use: The Vizbox is designed to be operable by anyone – no specialized training or technical skills required, allowing individuals using virtual reality for the first time to set the system up without assistance in minutes. Built In Tracking System: The VizBox leverages an Oculus Rift HMD with Touch Controllers and features the Oculus tracking system built directly into the unit, allowing you to experience fully immersive 6DOF interactive VR content as soon as you open the box. 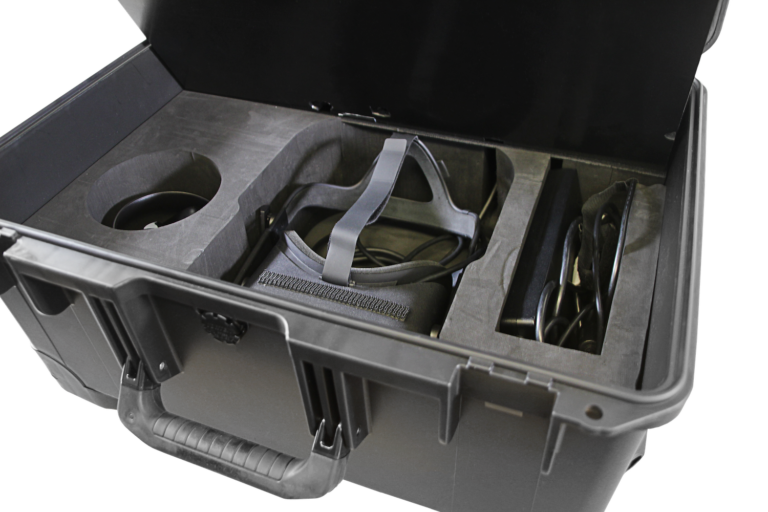 Strong Enough to Ship: The entire VizBox unit is built directly into a hard-sided Pelican case featuring custom cut foam inserts with designated spaces for all components so that you can confidently ship your VR system and content directly to your clients. The VizBox, together with Vizible, our new cloud-based collaboration and content creation platform for VR, provides an unprecedented access point for professional virtual reality users. With Vizible, you can design fully immersive interactive VR presentations with zero programming, and then easily meet with remote participants in a secure, real time collaborative VR session. Client doesn’t have a VR system? That’s where the VizBox comes in. Ship the VizBox to your client, and meet in VR, saving thousands on travel. We’re taking orders now for the VizBox, which is available now: you can reach out here to inquire.